fine water: Tying Talespinners - No this isn't a new fly. Tying Talespinners - No this isn't a new fly. I woke up today to take the dog on his morning walk and realized it was freaking cold at 6am. The thought came to mind "what a great day to spend indoors tying flies." You know this is the time of year when we tend to spend more time @ the tying desk to restock those fly boxes. 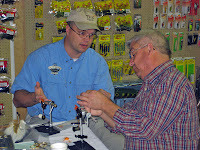 Today we had agreed to go out to Talespinners Outdoors and do a fly tying demo and maybe even a little casting instruction if there was any interest. The tying demo went well - tying up Wooly Buggers, Clouser Minnows, and other streamer flies. We even did about an hour of casting instruction. Now you may be wondering - why blog about a tying demo? The reason is to let you guys know about the operation that is Terry and Gin Tucker run out in LaFayette, Ga. I was able to observe the customer service that they provide to their customers and let me tell you, these guys do it right. Currently they are just getting started in the fly fishing end of their business but they are starting off right. They carry TFO rods and reels and Teeny fly lines and have plans to expand with other brands soon. This is on top of everything else they have in shop. From shotguns and bows to Nucanoe and duck blinds they have you covered. Stop by if you find yourself on N Hwy 27 in LaFayette, Ga and keep your eyes on our blog calender for more events @ Talespinners.